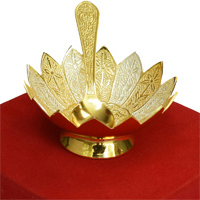 This diya makes for a perfect sacrament, perfectly hand shaped to resemble a flower. 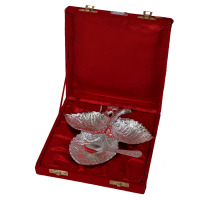 Get this elegant looking German silver 3-piece duck bowl set. The dual tone of this bowl set makes it even more attractive. 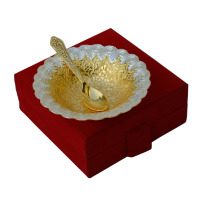 Lotus Shaped German silver made Bowl with decorated spoon to make your dish sweet. 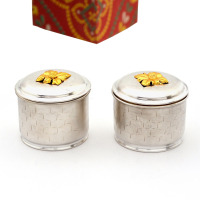 Buy this round shaped bolwl made from Germen silver for your household. 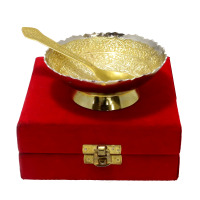 This bowl is designed with the influence of Rajasthani art form. 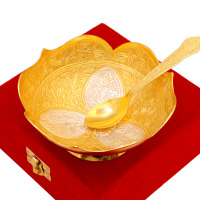 The fine craftmanship & excellent quality of this round shaped bowl is truly epic & makes it a must to have product. 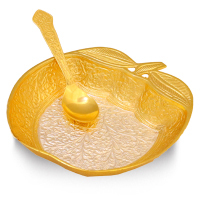 The combination of Dilver & golden hue makes the glass utterly gorgeous. 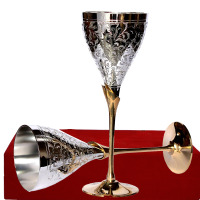 Made from Germen silve, these wine glasses are the must to have for you if you are a party lover. 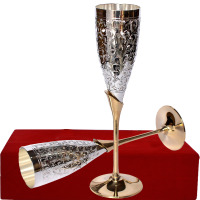 Design, shpe & finishing of the glasses will definitely make your drink more enjoyable. 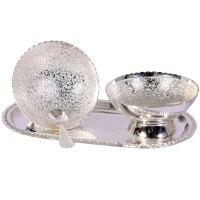 The perfect set of bowls for dessert, this set of two toned german silver bowl is very elegant & decent. 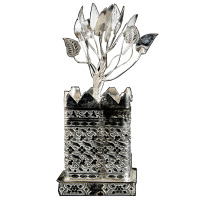 Buy this elegant german silver tulsi tree show piece and add to the class of your home. 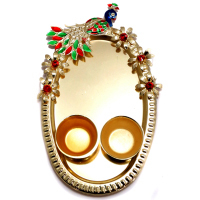 This show piece would go well with any number of different show pieces which makes it quite versatile to use. 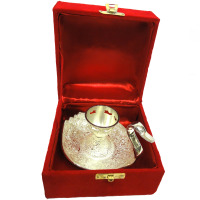 Light candles and decorate your home with this attractive german silver candle holder. Love Drinking With Your Partner? 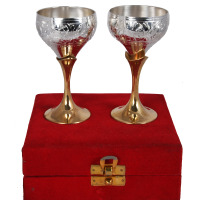 Unmatched experience of drinking in duos with your life partner was never that goo as it is with the Two-Ton German Silver Wine Glass Set Of 2 . 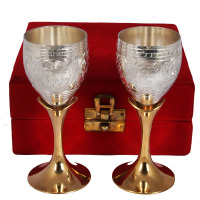 Make sure you get the right quality of German Silver glass. 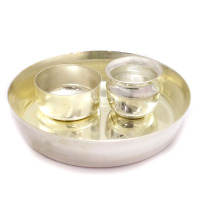 Designer German silver made Pooja thali with bell, diya and agarbatti stand to spruce up your antique showcase! 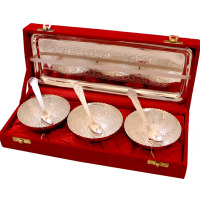 Beautifully decorated Twin bowl set made of German Silver for serving teastiest treats. 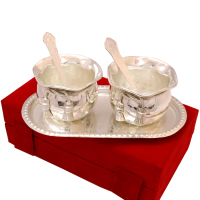 Silver coloured twin bowl set made of German silver for your tasty nibbles. 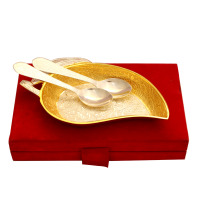 Be the giver of perfect gifts with this two toned german silver bowl and spoon set and earn all the praise you deserve. 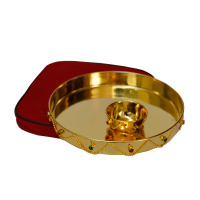 Put a smile on your dear ones face with this amazingly crafted german silver bowl, designed with outmost care. 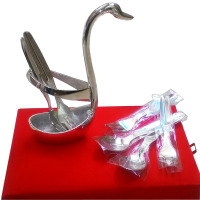 Decorate your dining table with this attractive swan shaped spoon set. 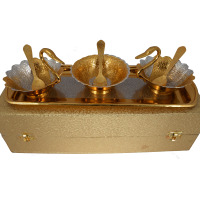 Such a tray and bowl set is going to enhance the taste of delicacy served on it. 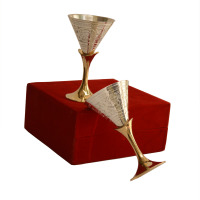 Share a drink with your peers in these cool and elegant german silver wine glasses. 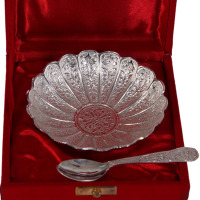 This is equally excellent either for impressing your guests by serving a desert in them or presenting them as a present on an awfully big day to somebody you're keen on dearly. 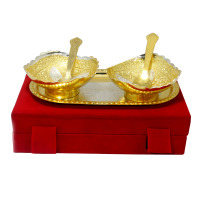 Shaped like twin Piper betel leaves joined with the ends opposing one another, the plate is convenient to carry with its 2 solid silver handles, and additionally offers an incredible sight to lay eyes on with its ethnic design. German silver is an alloy made primarily of nickel, zinc, and copper in various proportions. It is thus named thanks to its silver white appearance and used extensively in handicrafts thanks to its durability and resistance to corrosion. 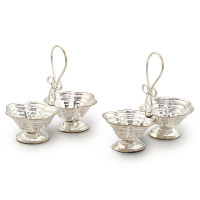 The process for creating German silver was perfected in Germany in the early 19th century by scientist E. A Geitner and its use subsequently spread to the rest of the world. 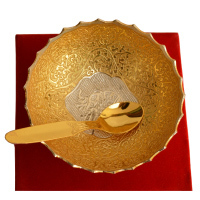 It was initially used in the creation of silver plated cutlery, coins, jewelry, and instruments. 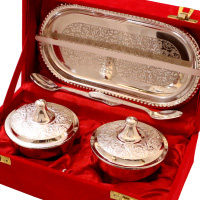 Today, finest quality cutlery sets carved from german silver can be an excellent option for adding to the aesthetic splendor of any dinner table or gifting to your loved ones. It is a rich material, which is highly durable, and this makes it ideal for use. 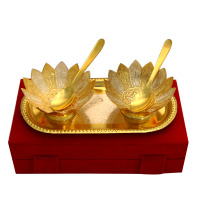 At Boontoon, we present the most mind dazzling array of items carved from german silver online. 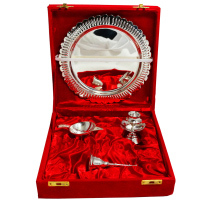 Our extensive collection of german silver handicraft items includes Pooja Thali, Bowl Sets for serving pudding, Glass Sets, Wine Glasses, Dibbi Set etc.. is sure to blow the breath away of the avid lovers of intricate handmade items to add a dash of glamour to their dinner tables. Each item is intricately created to ensure durability, beauty, and usability. 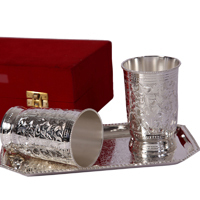 Different items come in different tones including white silver, two tone silver gold etc. Items come in several different shapes, sizes, and designs to suit the user’s needs. 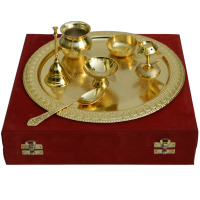 Items are available for a variety of occasions including weddings, anniversaries, diwali, retirement party, house warming etc. 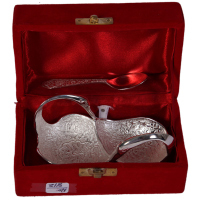 Why us for German Silver Handicraft Items? 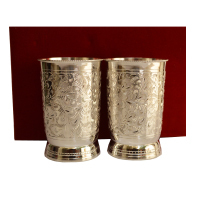 We offer great silver handicrafts that are ideal for vamping up your decor, giving as corporate gifts for employees, clients etc.., celebrating special occasions and even enjoying the odd glass of your favourite wine. 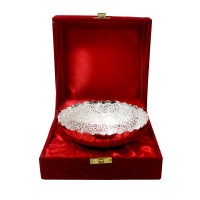 Our items come packed in luxurious boxes that can be used for display or simply storing your precious items. 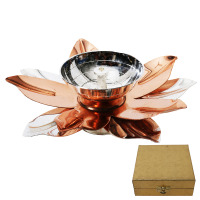 Highly affordable, they can be purchased singly or in bulk orders to gift to multiple people. 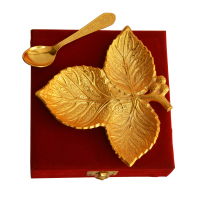 We take great pride in keeping intact a glorious track record of forging business relation with only the best and most creative artisans of german silver articles. 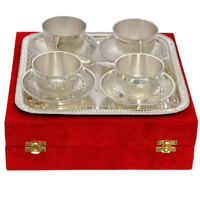 Thus, our customers can rely upon us for acquiring the best of german silver items in India, USA, UK, Singapore, Germany, Canada, Japan etc & worldwide. 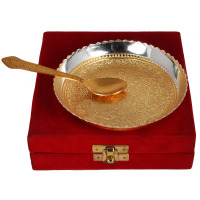 At Boontoon german silverware gift comes with the promise of elegance and a rich look that is sure to delight the receiver. 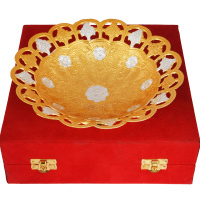 Whether you are buying something for yourself or a friend or family member, you can be sure to find quality handicraft items that will be enjoyed for a long time to come.